In the wake of the Snowden revelations, many in the legal profession have grown concerned about the ramifications of surveillance and encryption. Law and discourse about the legality of encryption are rapidly evolving. But encryption and privacy also have day-to-day implications for attorney-client privilege. What do lawyers need to do in order to maintain client confidentiality? Join Gus Andrews with guests Harlo Holmes from Freedom of the Press Foundation and Jonathan Stribling-Uss from Constitutional Communications for a brief breakfast presentation and discussion about best practices in digital privacy and law. Talk with other lawyers about their experiences using secure technology within their firms. But there are still steps we can, and should, take as individuals and as professionals to protect our own and others’ data. In this session we will discuss the current challenging climate and help participants—journalists, librarians, attorneys, and anyone else who is interested—understand how to ethically engage with information technology. There will be time at the end for questions about specific privacy-protecting tools, so bring your laptop or other device. Jonathan Stribling-Uss, Esq is the director of Constitutional Communications, a nonprofit organization that specializes in information security for professionals and civil society organizations. He has led trainings and CLEs for nearly two hundred attorneys on cybersecurity, privacy rights, and attorney-client communications with the NYCLA Bar Association, Law For Black Lives, and the Continuing Legal Resource Network at CUNY. He has also trained journalists, grantors, activists, and technologists at the Center for Constitutional Rights, Thoughtworks, the International Development Exchange, the Bertha Foundation, the Legal Clinics of CUNY School of Law, and Brazil de Fato. If you’re not into handing all your privacy to big brother, head to this beginner anti-surveillance skill share at the activist community center Mayday in Bushwick at 3 PM on Saturday, where Stribling-Uss will teach you the latest on cyber-security and data protection. Stribling-Uss first learned to encrypt messages after he was deported from China in 2008 for taking part in a demonstration to support Tibet. Thanks to secure texting and calling tools, his group had managed to avoid surveillance and unfurl Tibetan flags at the Beijing Olympics. “We wouldn’t have been able to communicate without that,” he said. “In China, they monitor all the networks.” At the time, he didn’t know the U.S. was using the same methods to surveil, both internationally and at home. Now his organization trains lawyers, journalists, non-profits and movements like Black Lives Matter, to ensure that their communications systems are protected from both the government and hackers. This Saturday, show up to Mayday with a laptop and USB drive (suggested donation is $10-$20) and he’ll teach you a primer on the anti-surveillance toolkit: onion routers, Tor, OTR (Off The Record Chat) and PGP email servers (Pretty Good Privacy). You’ll leave with “the world’s most secure operating system” and a bundle of security tools. Aren’t sure if you should be concerned? Who cares about the awkward selfies you send your friends? Think again. Stribling-Uss says a well-known organization was hacked for ransom in the middle of a training he was giving. “It’s way more common than we are made to believe because no one goes public,” he said. Still got an appetite for more? Why not check out this Bushwick/Bed Stuy cop watch training open house after you’re done updating your system. It’s taking place at The Base community organization at 7 PM. Attorneys in practice today are being faced with a myriad of IT security and privacy issues. Therefore it is more imperative than ever for attorneys to understand recent technological developments and the risks associated with them, including their widely acknowledged duty to stay conversant with technology in order to represent their clients adequately and assure confidentiality of client data and privileged communications. 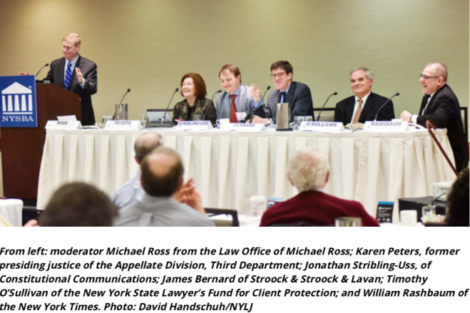 A panel of ethicists and technical experts will lead the discussion that no New York attorney can afford to miss, especially sole practitioners, small and mid-sized firm members who typically do not have in-house technical resources to rely on.